Hands down my highlight of SDCC 2011 was meeting Le Merde and chatting it up about vinyl toys and the Kinnikuman universe. In a rather serendipitous twist of fate I hit the Gargamel x Grass Hut booth, and discovered the undisputed holy mecca of Kinnikuman fans at the con. Three cheers for Art Junkie Kinnikuman shirts. Le Merde as it turns out is a HUGE Kinnikuman fan, and I give him major props for taking some time to kick it will ol' Nama Niku at their booth. He is insanely talented, and I seriously dig all his figures and artwork. He explained that his new Megalith design was partially inspired by his passion for M.U.S.C.L.E. and Kinkeshi, and I have to say that the sculpt is beyond cool. He also let me check out some of the crazy keshi the Gargamel guys brought for him from Japan ~ can't get enough of rare boots! Be sure to check out Le Merde's collabs with Super7 and Gargamel. You can also see a sample of his vinyl figures over at his blog. Le Miniverse ~ You Guys HAVE to get these! Flesh Mania print by Le Merde ~ a possible new meaning here... ? Also big thanks to Arbito and the Gargamel guys ~ really digging my Mini Squishy figures and Mini Pocket Kaiju. 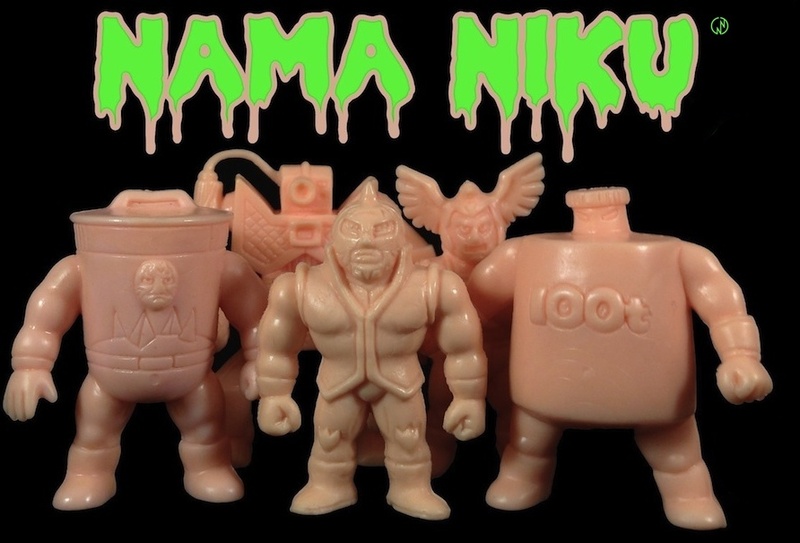 It was totally rad to talk to you all about Kinnikuman and the amazing figures you are creating! Can't wait for SDCC 2012! Wait! You met Josh Barnett? I've been mezmerized by his last match against Brett Rodgers and watched it several times. He's a master at what he does. What's his connection to SDCC? Was he there with a certain artist? Was he there as a collector/fan? The Le Merde stuff is awesome indeed. I have to get my hands on those three Le Miniverse figs for sure! Josh was at the Gargamel/Grass Hut booth doing signings of the latest issue of Drunken Master. Kiyoshi (Lucky Nakazawa) did an interview with Josh in the latest issue. Josh knows all those guys, as well as Kato from Art Junkie. We both know Kato and Yudetamago... Crazy huh? I was kinda shy and did not ask for an autograph.... Kicking myself now. Check out Drunken Master for sure! Kiyoshi also had a Gargamel mini fig there!